This small jewel-like watercolour with traces of gold was pasted directly onto a leaf in an album Burne-Jones titled 'The Flower Book', containing his fantasies inspired by the names of flowers. He added to it periodically from 1882 until his death. The scene suggests the story of Ariadne, who gave Theseus a ball of golden thread to unwind as he wandered through a labyrinth in search of the minotaur (a mythological creature, half-man and half-bull). Here she waits anxiously for her lover to follow the thread back out of the maze. The melancholy title is a colloquial name for a flower (probably either Clematis vitalba or Nigella damascena), which suggested the image of a maze. It may also allude to the disappointing outcome of Ariadne's love: she was abandoned by Theseus on the island of Naxos. 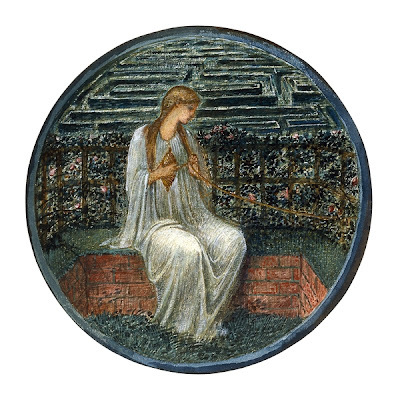 Burne-Jones delved deeply into classical and medieval legend for subjects for his art, sometimes (as here) using only the barest hint of a narrative as the stimulus for his rich imagination.